Calling all Friends fan! This is the show for you! Don’t miss FRIENDS! 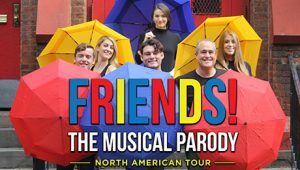 The Musical Parody, which will be appearing at Pickwick & Frolic/Hilarities 4th Street Theatre (2035 E 4th Street Cleveland) this Wednesday Jan 30 at 7 p.m. Thursday Jan 31 at 7 p.m., Friday Feb 1 at 7 p.m. and 9:30 p.m. and Saturday Feb 2 at 4 p.m., 6:30 p.m. and 9:30 p.m.
Purchase your tickets today at https://www.pickwickandfrolic.com/2018/10/friends-the-musical-parody/.